“Turmoil” Nadu needs a Naidu!!! The once prodigious state of Tamil Nadu (TN) has in the past few weeks earned a pitiable sobriquet of “Turmoil Nadu” and not without reason. The state has been in a state of incapacitation ever since it’s Ex- Chief Minister the late Jayalalitha, was herself bed ridden for multiple health problems around the same time, last year. From then on, TN has been limping from one crisis to another. If it was uncertainty over Jayalalitha’s survival for few months since September, it was the crisis of her death in December for few weeks followed by the now done and dusted Jallikattu controversy in January. When one thought that “Thai piranthaal Vazhi Pirakkum”, it is was the “Amma” of all leadership wrangles which ensued, resulting in the unceremonious exit of O. Panneer Selvam (OPS) as Chief Minister. The subsequent sentencing of Sasikala, the 24*7 resort drama that followed and the many heart to heart discussions various leaders had with the soul of Jayalalitha at her Samadhi consumed the state for few more weeks till Edapadi Pazhanisamy (EPS) was installed as Chief Minister. When one thought that the worst for the state was over, then came the cancellation of the bye election in R.K. Nagar constituency following brazen distribution of cash even at the peak of Demonetisation! For political parties, fishing in troubled waters comes easily. BJP at the centre has been no exception in fishing in TN’s muddled waters. With the spectre of a drought looming large, this fishing expeditions so far have not yielded much results. Yet, it has not stopped the BJP from trying. Throwing the hat into the circus ring or rather posturing to throw have been two ageing star actors – Rajinikanth and Kamal Haasan, who of late have found the voice to raise against the not so new ills of TN. As I write this, it is yet uncertain if these will remain dress rehearsals sans a final stage performance! In the meantime, there has been coming together of the OPS & EPS camps while isolating the Mannargudi camp which has been camping in one of the resorts in Pondichery. Or may be Coorg. Or is it Kerala? With the judiciary intervening almost on a daily basis on conducting a floor test, on disqualification of the defectors and generally everything, one can be certain that the state is in Coma and governance in suspended animation! The Tamil Nadu I grew up was never like this. Even today, in spite of the lack of any meaningful governance, the state does still rank high on many social indices. But this is living in past glory and milking the once healthy cow. The seeds for today’s rot have been systematically sown by the two Dravida parties who have been ruling the state alternatively since the death of MGR. To be fair, till the beginning of this century, things were not bad. Almost ten years ago, a foreign visitor after visiting few states like Maharashtra, Karnataka, UP, the then AP, and in the end TN asked me why things were looking better in TN compared to the other states. And like all Indians who never say “I don’t know” to any subject on the earth, I gave my own theory. Which was that TN was the only state where the economy was quite balanced between Agriculture (Rice), Manufacturing (Auto, Textiles and small machinery) and Services (SW). Unlike other states even when growing well, the growth was not balanced between the sectors and hence created its own problems. For example, Karnataka had a high share of Services and less of Manufacturing while Punjab had a high share of Agri and Industry but less of Services. But if I look at the statistics today, this is indeed the case for TN and this has certainly ensured a very equitable growth in the state and no other state comes close to this balance. In Telangana, K.T.Rama Rao, its IT minister and son of the Chief Minister, has been in the forefront of attracting investments in the IT sector. In my own resident state Maharashtra, the young and dynamic Chief Minister Devendra Fadnavis is focused on making Maharashtra the most sought after destination for manufacturing again. And he already has a few early wins. Among his other plans are big bang infrastructure projects like Mumbai – Nagpur Express way,… In Rajasthan, its Chief Minister Vasundara Raje has been the flag bearer for labour reforms for the entire country. In the midst of such action, what has been TN up to? Plunged in a serious leadership crisis ever since Jayalalitha went to jail in 2014, TN has been just a torch-bearer for sycophancy saddled between MGR/Amma anachronisms on the one hand and OPS/EPS/TTV acronyms on the other. So, for “Turmoil” Nadu to regain its past glory and become a “Thalai” Nadu once again, its needs a Naidu like leader! ASAP. No, as of yesterday! Do you have any picks? I have none at the moment. Modi Sarkar and the Gita Saar!!! As Modi Sarkar completes 3 years in office this week, the media is abound with pieces on the hits and misses. Depending upon who the author is and his/her political leanings, the pieces portray either a Glass Half Full or Half Empty picture. Very few have been honest portrayals. As Aam Aadmis, it’s but natural that our opinions are influenced by what we read/see in the media. So per what we see these days, the economy is doing rather well – India is the fastest growing economy in the planet. The stock markets are on fire and at historical highs! India’s consumer price Inflation stands lowest since we started publishing consumer price index in 2012. In the past weeks the Rupee has been strengthening Vs. the Dollar though this is a double-edged sword. FDI has been seeing record inflows. And if you go by some of the pronouncements of the Govt. there again the last 3 years have been very busy for the Govt. of India. Infrastructure projects mainly on Roads and Railways have been unleashed like never before. Govt. has been kicking off programs like Make in India, Skill India, Start up India,..,.. to increase the employment and employability across sectors. Price control though a very socialistic intervention has been resorted to particularly in the healthcare sector to prevent fleecing of the common man. Programmes like Jan Dhan Yojana, Swachh Bharat and Aadhar have been given a fresh impetus right from the top. In the 1st 18 months, the Prime Minister took it upon himself to travel to countries that mattered to signal the change and restore confidence on the India Story. The results have been emphatic. World over, it is now acknowledged that this Govt. under Modi is on a crucial transformative path and probably this time this is for real and long-term. (In the past India always flattered to deceive). The inflow of FDI and announcements of various projects in Mfg. and Infrastructure are there to see. While this is the flavor in the media by and large, it will be interesting to know what the sense on the ground is. If one goes by electoral results as in a democracy it is the barometer of an incumbent Govt.’s performance, there are no two ways about Modi Sarkar. By and large in all types of elections, Modi and his government have got a thumbs up from the electorate. In Economic times’ survey of the Indian Industry, the Industry has clearly thrown its weight behind Modi Sarkar. In Britain, mid-term opinion polls ask a simple question to respondents: “Are you better off today than you were three years ago?” It would be interesting to know the outcome if somebody does a similar mid-term poll in India to understand what’s in peoples’ mind. My hunch is that the response will be a farrago of sorts. First, that the conditions on the ground are yet to change. And, second that still the people are happy with the Govt.’s performance. And yet this is fully understandable. For all the economic indicators and the efforts which have been put in by the Indian Govt. so far, on the ground, results are yet to show up. The fastest growing economy or the influx of FDI or the flag ship programmes kicked off by the Govt. or the massive increase in infrastructure spending and the many other initiatives are yet to result in changes in the life of the common man. In terms of jobs/increased disposable incomes to workers, farmers, middle class,.. And yet no one seems to complain. People still have immense hope on the Prime Minister and his Sarkar. The public so far seem to be satisfied as long as their Govt. is earnest in their intentions and seen to be carrying out their job sincerely. The hope being that this is still “Work In Progress” and results will follow sooner or later. The common man’s response to Demonetisation is a good example of this behavior. It looks like the Govt. is also taking this Gita Saar seriously and moving forward on a mission mode without getting too much flustered by the noise around it. I must say here that while this is true for most of the ministries, there are some which have not taken the Gita Essence seriously. I am not sure if the Smart City project has gone beyond announcement of a list of cities. No one knows what the Ministry of Agriculture is up to in transforming the agricultural landscape which has been fraught with draught related woes at times and flood related at other times. That is to name a few. So when the PM does a review of the performance of ministries on completion of 3 years, we hope he cracks the whip on those who have not taken their mission seriously. And reminds them of their Karma and another gem from the same Gita which says, “The meaning of Karma is in the intention. The intention behind action is what matters”. And declares, Abki Baar Gita Saar!!! 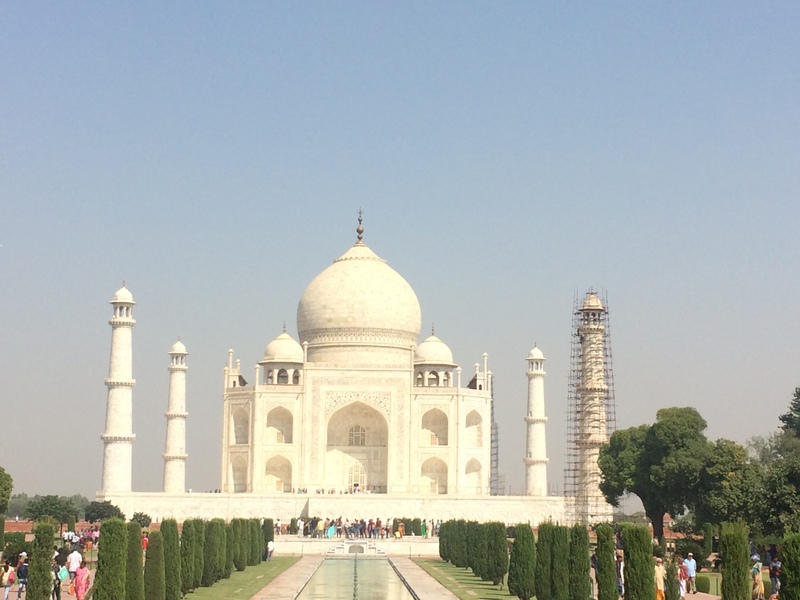 When I visited Agra and the Taj Mahal last week, it was exactly after 10 years. That was in the midst of a hot summer in 2006. Much water has flown in the Yamuna since then and 10 years is a good time to see for oneself if the so called winds of change blowing across the hinterlands of India is for real. In these 10 years, the “Elephant” and the “Cycle” have got their opportunities alternatively to ride in Uttar Pradesh with the “Lotus” blooming or rather looming large at the centre! We left Delhi pretty early (5.30 am to be precise) to beat the morning traffic till Noida. Close to Aerocity the new Airport hub replete with hotels and offices, even in the wee hours the roads were busy. One, with the slew of vehicles ferrying the staff from Call centres and BPOs of Gurugram after the night US shift and two, with the panoply of cars of all hue waiting in the roads for the call from their owners when they land at the airport. Now here’s the dichotomy. Folks who don’t bat their eyelids to write cheques for purchasing cars of the types of Audi, BMW,.. whine to pay the parking fees at the airport! So the drivers just hang around choking the roads leading up to the airports. (This by the way happens in almost all cities in India, I guess). After that initial congestion, the drive through the Lutyens’ Zone was nice. Lutyens’ Zone could be a credible advertisement for Swachh Bharat mission I thought. But then it’s always been that way. Once we cross Noida, we quickly enter the new Yamuna Expressway which is supposed to make the Agra and the Taj trip more memorable. Earlier also folks from abroad always remembered the Taj Trip very well for the long travel from Delhi to Agra. The Expressway is international class so are the toll fees! But then if we need quality infrastructure and if private guys have to develop the same, you need to pay for it! Along the Expressway one cannot miss the Buddh International Circuit built for bringing F1 to India. It’s sad that India doesn’t feature on the F1 calendar since 2013! The circuit now is reduced to hosting national races and being a promotional/testing venue for automobile manufacturers. Blame it on the financial troubles of the promoter Jaypee group or the bureaucratic hurdles around hosting F1. One hopes F1 returns to India soon for the changes in brings in the landscape overall – partly which is even today visible. However just ahead, confirming the winds of change were the surprisingly neat and clean toilets at the 1st break at the food plaza!!! The Expressway has a speed limit of 100 kmph for cars and 60 kmph for heavy vehicles. The driver of our luxury coach clearly believed that ours was a heavy vehicle and never for once allowed for himself the luxury of accelerating beyond 60 kmph. Never once. Now this discipline of following speed limits on highways must qualify as a big behavioral change! As the Expressway ended and we entered the city limits of Agra, the dream drive ended. We were back to the early morning hustle bustle of a small town with buffaloes, dogs, hen and monkeys interspersed with a whole lot of people, handcarts, autos, crowded tempos,… on the roads. Busy road side eateries were rustling up morning snacks and the overall “dust bowl look” hardly can pose for Swachh Bharat. The road from where the Expressway ends leading to the Taj is surprisingly still narrow with chaotic traffic. The very impressive guide (impressive with his suave English and worldly knowledge) who joined us at Agra would tell me later that a highway straight from the Expressway to the Taj is ready and would be open to public soon. It was apparently waiting for the UP CM Akhilesh Yadav who has been busy with his parivar war these days! The guide cautions us of all things prohibited inside the Taj. Well except for cameras, phones and wallets everything else is – looks like. The 1st sight of the Taj as you enter from the main door is breathtaking and indeed the best sight! The guide no longer tells stories of why Taj was built as he knows very well that the tourists are all Google savvy these days. He focuses more on the intricacies of the construction and why it is a Wonder of the World. 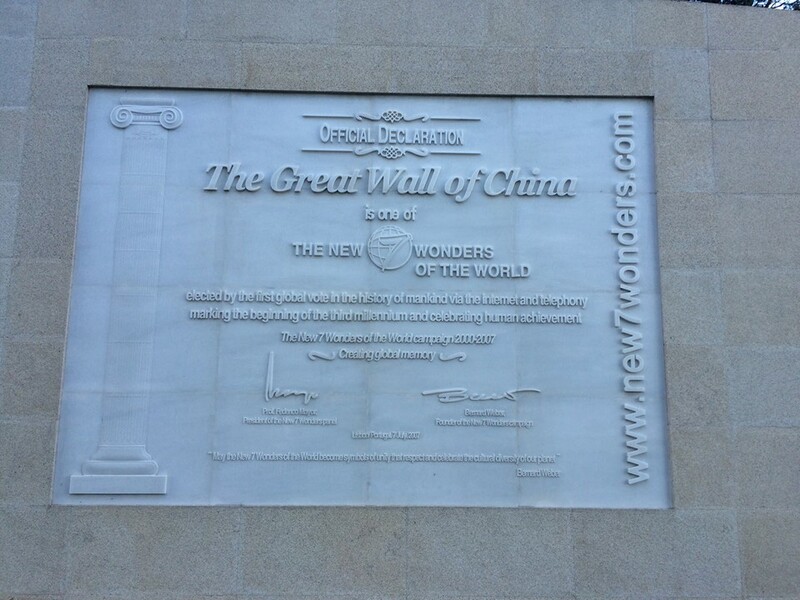 Talking of Taj being one of the Wonders of the World, at the Great Wall of China you can see an official certificate declaring it as one of the “New 7 wonders of the world”! Wonder why we can’t have a similar plaque at the Taj??? The whiteness of the Taj has been fading thanks to the excess pollution over a period of time. So the authorities have undertaken a massive job of restoring the whiteness of the marble with surface treatment. We were told that they use what is known as Multani Mitti (mud from Multan). This process is underway and one could clearly see the difference in the 3 of the 4 minarets where the treatment is already over. The main dome will be up for treatment soon next year during which time it may be closed and will be a letdown for the tourists! Considering that Multani Mitti is from Pakistan – wondering if MNS will have a problem with that under the present Indo-Pak rough weather! The Diana Bench which has now become the best photo-op place or rather selfie spot at the Taj– continues to reinforce what marketing and PR can do to a product. A spot where couples celebrate their love with that enduring pic is named after a person for whom love was elusive for most of her curtailed life! Compared to the last time, the vicinity of the Taj is certainly neater, cleaner and devoid of general litter. Of course don’t expect us Indians to drop all the disposable shoes only in the bins kept for that purpose. Bins are provided and as is our habit we litter the shoes all over the place! A good over 2 hours spent at the Taj and post lunch we visited the other monument – the Agra Fort. Agra fort is also impressive and brings a lot of high school history lessons back to memory! The emporium which the guide took us for shopping was expensive even for the foreign visitors in our group. But what was striking was the way they explained the process involved in the making of the marble handicrafts in understandable English. And didn’t do the pushing and shoving to buy! Talking of push and shove, the road side vendors hawking different “tourist targeted” stuff were polite and didn’t really hound us – a change from last time. As we left Agra for Delhi, again a very pleasant but slow drive on the Yamuna Expressway was fantastic. In the backdrop of the setting sun, the smoke from burning of the agricultural fields create a hazy feel and of course add to the pollution of the capital. I read about this practice of burning the rice stubble by farmers once the harvest is over just few weeks ago in a “Swaminomics” column in the Sunday Times of India. Read here. As pointed out in that piece, it’s high time, they find an alternate to this polluting practice lest any “Odd-even” or other kind of idea is not going to help curb pollution levels in Delhi. Once we crossed Noida, we couldn’t escape the now notorious evening peak traffic of Delhi. From Noida to the hotel took close to 2 hours! In India we now famously suffer from last mile connectivity! In almost everything. For example in roads, the highways like the Mumbai Pune Expressway or the Yamuna Expressway eases the travel between the borders of the respective cities but the journey from the end of the expressway to the heart of the city is still a nightmare wading through narrow roads and ever exploding traffic. So to conclude, many positive changes are visible. Few legacy issues remain. As in many other areas, “the elephant” is on the move and we are getting there albeit slowly. Though visiting after 10 years, this is my 3rd visit to the Taj and somehow for the 1st time I really felt like “Wah, Taj boliye”!!! In his 1st Independence Day speech post becoming the Prime Minister, Narendra Modi announced a dramatic and by any stretch of imagination a very ambitious goal of turning India into a ‘Swachh Bharat’ by 2019 – the 150th Birth Anniversary of Mahatma Gandhi. As far as ambitious goals for nations go, Kennedy’s – “before the decade is out of landing a man in moon and returning safely back to earth” goal set in 1961 usually comes up on top. But I would say that Modi’s goal of turning India into a Swachh Bharat is far more ambitious and audacious. Unlike ‘Project Apollo’ which only required commitment of huge resources and a focused effort from NASA, ‘Project Swachh Bharat’ required focused effort from Govt., funds, and more importantly a fundamental change in attitude of people. That too that of millions. 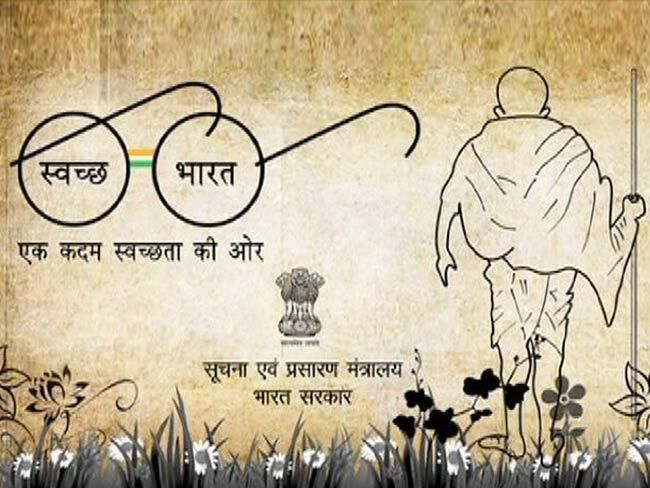 2nd Oct, 2016 – Gandhi Jayanti marked the completion of the 2nd year of Swachh Bharat Abhiyan in India. As one who was and is excited about this project right from when it was announced and is keen to see it succeed, I make a conscious attempt see how the program is progressing. So not surprising that this is my 4th post on this topic!!! And based on what I read and see at least in Mumbai where I live, I can say that while the Govt. is sincerely working to make it work, we as people are failing the same. 2 years down the line, as I observe what is happening, it’s very clear that the Government has turned its focus on “Capacity building” – pouring money on building toilets and other sanitation related infrastructure as can be seen in the dashboard. Not just in villages. Even in cities like Mumbai, I am seeing “E-toilets” which have sprung up on highways. And I hope the Govt. is putting to good use the 0.5% Swachh Bharat Cess it is collecting from us. The civil society comprising of NGO’s, Action groups,… are still carrying out their regular Swachhata activities though not as frequent or as visible as in 2014. The Municipal administration, I see routinely carrying out cleaning exercises and then painting of walls, road dividers and other assets more frequently than before. Awareness campaigns involving celebrities goading people to keep our cities clean,… are also quite omnipresent. Even corporates have pitched in to support the “Cleanliness campaign” some of them expectedly weaving into their product’s marketing strategy. The missing cog in this wheel is the attitude of the common man. What is happening there? We continue to litter in common places with gay abandon. I don’t see any remorse among people when they throw all kinds of garbage on the roads like wrappers, banana peels, cigarette buds, empty bottles, left over food,…,…! Mumbai which is the so called commercial capital is also the “Spitting” capital of India. Here people take pride in turning their mouths to ‘Pichkaaris’ and spit wherever they are except their own houses. “Painting the town Red” has gotten a different meaning here. The Government could very well launch a new game called “Tukemon Go”. We could sight and catch hell of a lot of “Tukemons” of the real type and not virtual just as we step out of the house. I feel ridiculously bad when I see the freshly painted Yellow-black road dividers smeared with pan tainted Red in roads and highways of Mumbai. Similarly the E-Toilets along the highways have still not prevented many to urinate on the side of the roads in the open! Any amount of cleaning is not going to make a place clean if this kind of atrocities continue. Ergo, while “Capacity building” is progressing well as I mentioned earlier, “Character building” is lagging behind. And for that we have nobody else than ourselves to blame. As a country it is our collective failure that we put “a clean surrounding” as least in our priorities even now when supposedly the literacy and economic well-being are on the up. A state like Kerala which is high on literacy is also among the cleanest states in the country. However when I see what happens in Mumbai which is a fairly literate metropolis, I have come to the conclusion that literacy has no bearing on Swachhata!! It is one’s attitude towards keeping common places clean which finally matters. I do feel that by 2019, the Government may very well achieve the targets it set for itself in terms of toilets,…,… but cleanliness may still elude perhaps even till 2050. For Swachh Bharat Mission to succeed while the Government works on Sochalays, “We the people” have to work on our Soch!!! And that Soch is – “Swachh Bharat Abhiyan is not about cleaning, but ending the need for cleaning”!